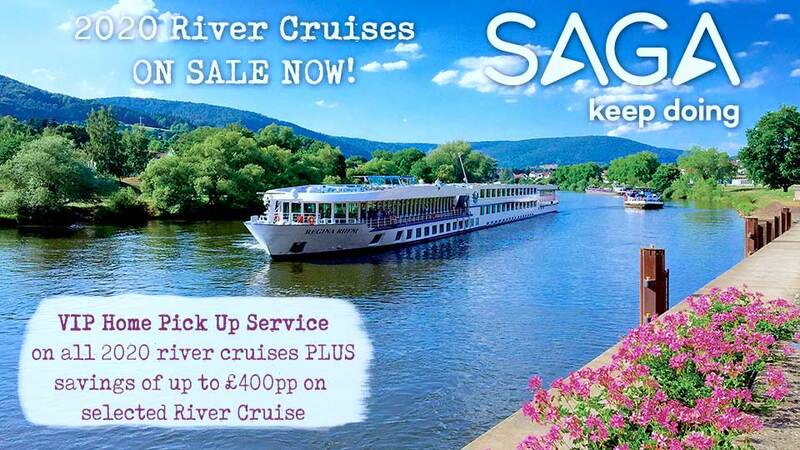 Discover a wealth of art, history and cultural treasures as you cruise to some of Europe’s most famous destinations. After embarking in Budapest, journey to Bratislava, Vienna, Passau and the 2,000-year-old town of Regensburg, a UNESCO World Heritage Site. Along the way, visit magnificent cathedrals and Baroque abbeys, sample Vienna’s sinfully rich sachertorte cake, experience the breathtaking scenery of the Wachau Valley wine-making region, and traverse Europe’s Continental Divide. Board your cruise in Budapest. Tonight, meet your fellow passengers at the Welcome Dinner as the ship cruises to Bratislava. This afternoon, arrive in Bratislava, capital of Slovakia. Enjoy a walking tour of the city’s major sites, including the Old Town Hall, Mirbach Palace and Gothic St. Martin’s Cathedral. Spend your evening in Bratislava before the ship cruises to magnificent Vienna later tonight. A panoramic tour of Vienna guides you past the majestic Opera House, the former Imperial Palace of the Hapsburg Emperors, Parliament, Town Hall and Vienna University. Afterwards, you will visit Vienna’s historic city center, a UNESCO World Heritage Site, and see St. Stephen’s Cathedral, Graben and the World Famous Spanish Riding School. You are free to explore on your own this afternoon, so be sure to sample some Viennese coffee and pastries. 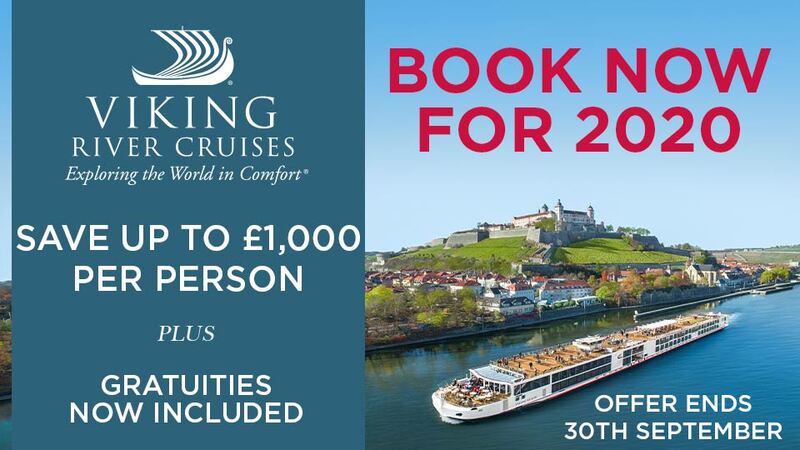 After reaching the Wachau Valley early this morning, you will have three tour options: A walking tour along Dürnstein’s cobblestone streets followed by a wine tasting, a hike up to the fortress where Richard the Lionheart was once held for ransom, or an apricots and sweets tasting. Later, relax on board during a scenic cruise through the beautiful Wachau Valley or join a guided bike tour along the Danube to Melk. Your ship arrives late this afternoon in Melk, one of Europe’s most renowned spiritual and cultural heritage sites, where you will tour its spectacular Benedictine Abbey. Afterwards, enjoy free time to explore the charming town of Melk on your own. Arrive in Passau, a 2,000-year-old city noted for its Gothic and Baroque architecture. You can explore this charming city on a walking tour, guided bike ride or on a hike up to the Veste Oberhaus Fortress. The ship cruises overnight. This afternoon, the ship arrives in Regensburg, one of Germany’s best-preserved medieval cities and a UNESCO World Heritage Site. You have your choice of one of three tours this afternoon. Your first option is a guided walking tour of the city’s architectural highlights, including the Old Town Hall and the Porta Praetoria, the gates to an ancient Roman fort built in 179 A.D. Your second option is an opportunity to sample the city’s most renowned specialties – sausage, beer and pretzels. Your third option is a guided bike tour from Regensburg to Walhalla through the spectacular scenery of the Danube Valley. 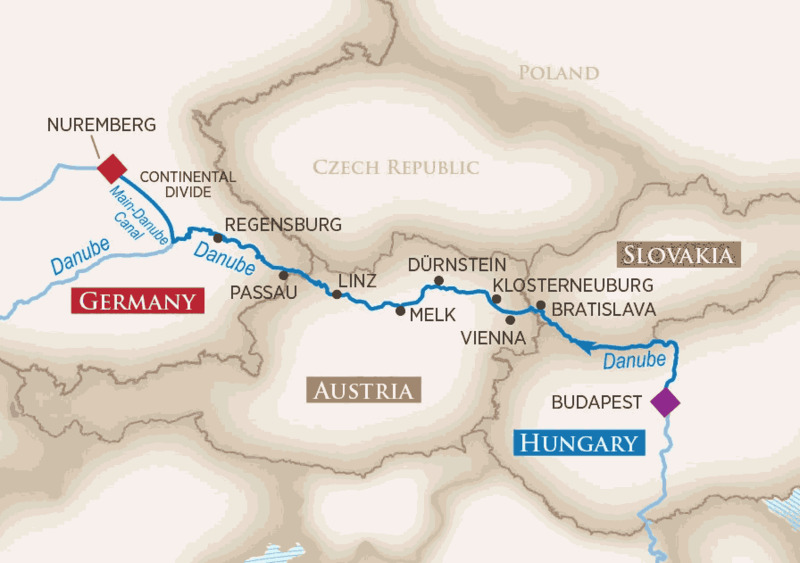 Enjoy a scenic morning cruise as the ship crosses the Continental Divide via the Main-Danube Canal and leisurely cruises through the beautiful Altmühl Valley. This afternoon, you have a choice of three activities in Nuremberg. 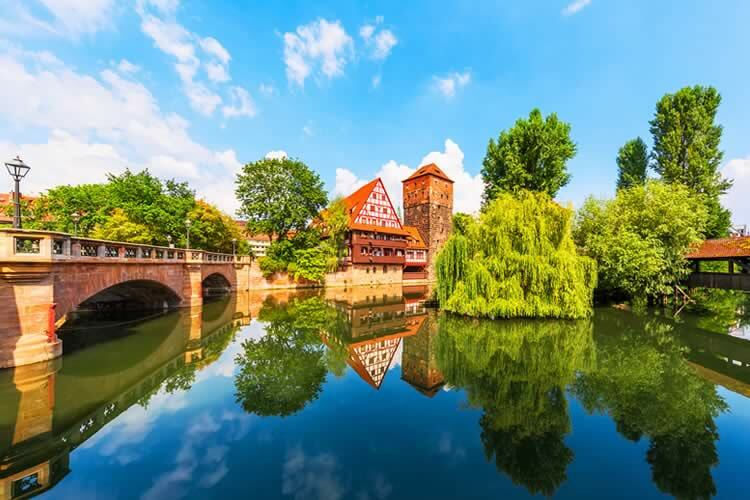 Take a tour of the city’s medieval highlights, including Nuremberg Castle, the 900-year-old ramparts surrounding the city, Town Hall, Notre Dame and the house of artist Albrecht Dürer, or join a WWII tour and see the Coliseum, Nazi Parade Ground and Justice Palace. Alternatively, savor traditional flavours on a Franconian Specialties tasting as you sample the famous Nuremburger Bratwurst, Rot bier and Lebkuchen. The ship moors here overnight. This morning, depart the ship after breakfast.